Graphite is a crystalline allotrope o carbon, a semimetal an a native element meeneral. 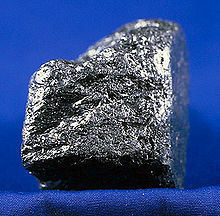 Graphite is the maist stable form o carbon unner staundart conditions. Tharefore, it is uised in thermochemistry as the staundart state for definin the heat o formation o carbon compoonds. ↑ Liquid method: pure graphene production. Phys.org (May 30, 2010). ↑ Anthony, John W.; Bideaux, Richard A.; Bladh, Kenneth W.; Nichols, Monte C., eds. (1990). "Graphite". Handbook of Mineralogy (PDF). I (Elements, Sulfides, Sulfosalts). Chantilly, VA, US: Mineralogical Society of America. ISBN 0962209708. This page wis last eeditit on 2 Mey 2017, at 01:45.